Spring exhibitions at the ICA address social conditions through art made by women | Arts and Culture | Style Weekly - Richmond, VA local news, arts, and events. Avatars, representations of blackness, the Shaker community, Alice Coltrane's jazz and income-based fashion. These are just a few themes explored in the spring exhibitions at the Institute for Contemporary Art, pairing work by Los Angeles-based Cauleen Smith, who was trained in film, with art by Belgrade, Yugoslavia-born Irene Haiduk, who now lives in New York City, and artwork by Martine Syms, another LA artist. In the first-floor gallery, Smith's multidisciplinary "Give It or Leave It" combines many things, including multichannel video, ready-made objects like shag carpet and disco balls, custom-designed wallpaper, and sound that explore the stories of musician Alice Coltrane, photos from 1966 by Billy Ray at the Watts Towers, Noah Purifoy's desert assemblages, and Rebecca Cox Jackson and the Shaker community. It's a mash-up of histories: Coltrane, Ray and Noah all lived in the 20th and 21st centuries, while Jackson lived in the 19th. However, Smith sees a connecting thread between these disparate narratives. "They all sort of created generous spaces in a really different way," she says. Similarly, she hopes that each figure acts as a model for visitors because, "[they are] something that I think people need to think about now instead of everybody thinking about their own little piece of pie. … Maybe if we look at all these models and people of the past who managed to enact radical generosity, we can learn from that." Smith's exhibition opened in Philadelphia, but there are a few changes for the Richmond iteration because of the differences in architecture. For example, Richmond's venue offers two new installations of colored film gels on the windows to reflect swaths of glowing color either onto guests, who can relax in lawn chairs inside the gallery, or outside onto the street. Chief curator Stephanie Smith says these opportunities for new works are "an essential part of our understanding of our work: to be an institute for contemporary art and to create opportunities to work with artists to help bring their creative visions to new life here at the ICA." While the institute will likely not be screening any of Smith's films, adjunct assistant curator of film Enjoli Moon explains that "the film program will overlap with the overall theme that you can kind of tie into all three galleries, which is this idea of women creating ideas and possibilities for the future." Up next is a screening of the 2018 documentary "Black Mother." On the second floor, artist Haiduk's installation is adjacent to Syms' "Shame Space" from 2018. Together they compose the inaugural "Dialogues," a commissioned series like the institute's "Provocations." Haiduk presents "Yugoexport," an ongoing artwork and corporation modeled after Jugoexport — they sound the same — a now-defunct Yugoslavian manufacturer. For "Yugoexport," the institute has hired attendants to sell shoes for men and women designed by Haiduk, manufactured in Belgrade, and modeled after ergonomic shoes previously worn by female workers in Yugoslavia during the 1960s. Staff members have each been given a pair to wear. The price for the black lace-up shoes varies and is determined by consumers' income levels, which the buyer decides. Chief curator Stephanie Smith explains that the installation is divided into two zones: a sculpture installation and a conceptual retail store flanked by infinity mirrors. In contrast, artist Martine Syms explores people's relationships to artificial intelligence and virtual avatars. Think, for example, of the iPhone's virtual assistant, Siri—through video, installation and performance. "[Syms], in her work, has been dedicated to the ways in which blackness has been integral to U.S. culture through fields like film, cinema and entertainment," explains assistant curator Amber Esseiva. "Recently she's turned her attention to technology and artificial intelligence and telecommunication tools: cellphones, the internet and social media platforms we engage with every day." By writing her own code, Syms created an avatar named Mythiccbeing that takes its model from contemporary artist Adrian Piper's male alter ego, the Mythic Being, which Piper began in 1973. 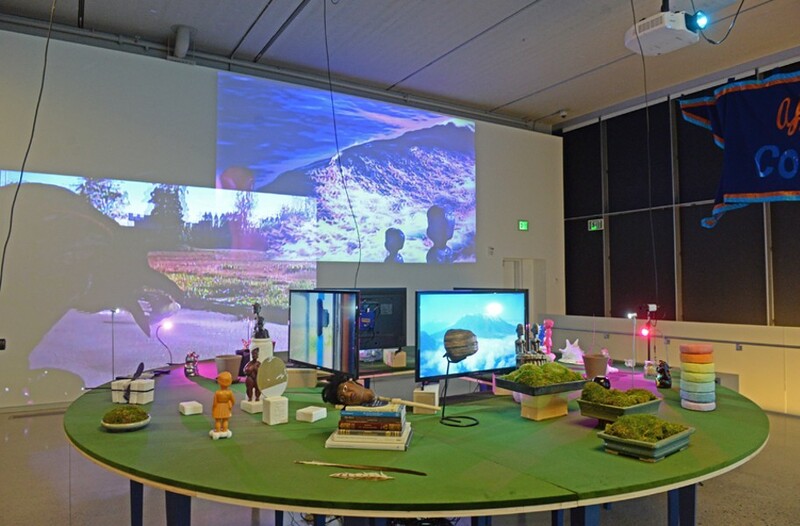 Visitors can speak with Syms's avatar through a chat bot that is programmed to sound like the artist. The bot asks questions, like "How do I cultivate joy? Will I ever stop being broke?" and visitors can then send short instructions to the bot. The sound, text and imagery on the film change based on what visitors' text to it. Esseiva gives context to these three exhibitions, maintaining that all address social conditions "by proposing ways of engaging with the future, proposing how we can collaborate with one another, how we can surround ourselves with objects, with technologies, with things that are ubiquitous to our living in the world that are being reimagined through works of art that are inspiring and charged with new possibilities and proposals for the future made by women." "Cauleen Smith: Give It or Leave It" opens Feb. 16 and runs through May 5 and "Dialogues: Irena Haiduk and Martine Syms" will run through May 12. For information, visit icavcu.org.